The challenge is distinguishing worry from anxiety. 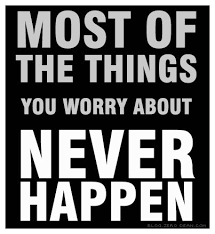 Worrying, as described above is a useful tool to keep us on track as we prepare for the future. Though considered synonyms, anxiety is something very different. Anxiety is fretting over things we can’t control. Anxiety is unhealthy. As Seth Godin says, “Anxiety is practicing failure in advance. Anxiety is needless and imaginary. It’s fear about fear, fear that means nothing.” Being the hypochondriac that I am, I am known to drive myself and my wife crazy with internet-informed self-diagnoses. (Sometimes worry does become anxiety, making it a complete waste of time.) But worrying can be a great self-accountability mechanism. Patty Smyth may be a warrior and at times I like to consider myself the same. But I haven’t a problem proclaiming that “I am the Worrier!” And playing along with her lyrics, being a worrier has helped me win on more than a few occasions. Though I have no anxiety as I prepare myself to contribute to an important engagement tomorrow, I am spending a little bit of time worrying about it, believing the willingness to worry (e.g., rehearse) will help me make tomorrow a bit more successful than it would be otherwise. There is a reason why most of the things we worry about never happen, and it’s not always because things aren’t worth worrying about. Are you able to make beneficial use of worrying? How much time do you waste being anxious?